What is a yellow tongue? The normal color of the tongue is light red or pink with a light, white coating. When the tongue is yellow there is a yellow coating, residue, or film on the tongue. A yellow discoloration on the tongue is often a harmless and temporary problem. That being said, a yellow coating on your tongue can indicate that something else is going on in the body. What Does a Yellow Tongue Reveal About Digestive Health? On occasion a yellow tongue is also a sign of jaundice, which is a problem caused by liver and gallbladder problems. Yellow tongue is thought to be a problem in adults and children, including newborn babies, toddlers, and infants. Yellow tongue will also affect pregnant women. You see a yellow coating may form due to the hormonal changes experienced during pregnancy. Yellow tongue will also commonly occur when you get up in the morning. When you sleep, bacteria or other substances will build up on the tongue. This will lead to a yellowish-green, yellowish-white, or yellowish-orange color. Those with yellow tongue may also experience the problem on different parts of the tongue, such as the top of the tongue, on the sides, the back of the tongue, or under the tongue. You may also find that the roof of your mouth, inside cheeks, gums, and other parts in the mouth may become yellow as well. There are also certain symptoms that you may experience with a yellow tongue. However, these symptoms will depend on what is causing your yellow tongue. Some of these symptoms include acid reflux, joint stiffness, red spots on the tongue or throat, bumps on throat or tongue, a sore throat, soreness, a common cold, a fever, burning sensation, a dry mouth, bad breath, or an overall bad taste in the mouth. A thick, yellow coating on the tongue also reveals a lot about a person’s digestion. It is a sign of poor gut health. That is because how well food or beverages are digested will show up on the tongue. In other words, the color of your tongue tells you how well you are metabolizing your food. In traditional Chinese medicine (TCM), the tongue is considered a very important sign for both the meridians and the internal organs of the body. A tongue with a thick and yellow coating or swollen taste buds will indicate excess heat or an interior heat pattern. An enlarged red tongue with a greasy yellow coating may indicate stomach and spleen damp-heat or yang deficiency. A thick coating on the tongue is a reflection of excess dampness, which is pathogenic fluid that contains an overgrowth of bacteria, viruses, yeast, or other disease-causing germs. Whenever you see a thick and yellow coating on the tongue, it is very important to make changes to your health. Poor digestion is also a sign of an impaired immune system. About 70% to 80% of the immune system is in the digestive system. Root causes of digestive problems also include high amounts of stress, nutritional deficiencies, and an imbalance of gut flora that is also called dysbiosis. What are signs that your yellow tongue is digestion-related? You may experience gas, heartburn, fatigue, constipation, food allergies, foul-smelling stool, or mood changes like depression and irritability. Black hairy tongue or black furry tongue: A black tongue that is furry or hairy is the most common cause of a yellow tongue. This can be due to smoking tobacco, poor oral hygiene, being dehydrated, taking certain medications, or radiation therapy to your neck and head. 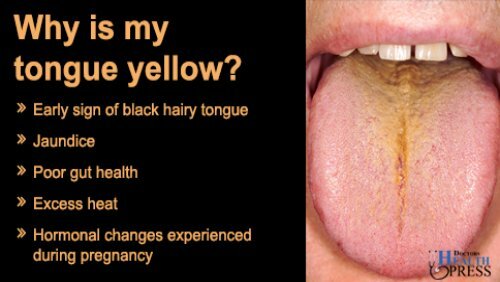 When the tongue is yellow due to a black furry tongue, there are likely other symptoms like hair on the tongue and a metallic taste in the mouth. Antibiotic use: It is also common to have a yellow tongue coating after using antibiotics. This is because the drugs cause an imbalance of flora or microbes throughout the body, including your gut and mouth. Excess bacteria growth: A thick yellow coating on the tongue is a clear sign of poor digestion, and intestinal permeability or gut flora imbalance. You will see a white or yellow coating on the tongue, and may have bad breath. Post-nasal drainage: A white or yellow coating on the tongue is common after post-nasal drainage. It is a condition characterized by excessive mucus accumulation at the back of the throat and nose. Causes of post-nasal drainage include sinusitis, allergies, acid reflux, and rhinitis. Jaundice: Jaundice will most often occur due to an underlying cause. In any case there is excess bilirubin, which are red blood cells with yellow pigment. UTI infections: It is also thought that a thick and yellow coating on the back of your tongue may indicate a urinary tract infection (UTI). Scarlet fever: Scarlet fever, also called scarlatina, is an infection characterized by a bright-red rash, a sore throat, and a high fever. The condition will also create red bumps on the tongue, and a yellowish-white coating or film on the tongue. It is also possible that you will have a white tongue with red dots and a beefy surface. This is also known as a strawberry tongue. Piercing, tooth extraction, or tonsillectomy: A yellow tongue and soreness may result from a tooth extraction, piercing, or tonsillectomy due to papillae inflammation. The yellow tongue will likely last up to three days. You should follow some of the proper dental hygiene methods mentioned below to lower the risk of infection. A sign of a bacterial infection is a yellow discharge from the tongue. Using oral care products: Another possible cause of a yellow tongue is oral care products. Regular use of mouthwash, in particular, can cause a yellow or orange color on the tongue. This is because certain mouthwashes contain astringent agents like menthol or witch hazel, or oxidizing agents like peroxide. It is a good idea to use an alcohol-free mouthwash with antibacterial essential oils, such as the one suggested below. Dry mouth and mouth breathing: It is normal for saliva to flush out bacteria and food debris from your mouth, which will prevent tooth decay. However, an excessively dry mouth due to mouth breathing can lead to a rough and yellow tongue, cracked lips, and mouth sores. This is likely because breathing through the mouth will introduce dry and cool air. A dry mouth may also be due to smoking, stress, chemotherapy, or autoimmune conditions like Sjogren’s syndrome or rheumatoid arthritis. Other yellow tongue causes include fever, scarlet fever, dehydration, mouth breathing, acid reflux, dry mouth, poor oral hygiene, or excessive caffeine or tobacco use. HIV/AIDS: A yellow tongue is also a rare sign of HIV/AIDS (human immunodeficiency virus and acquired immune deficiency syndrome). In HIV, the yellow tongue coating is usually caused by an oral infection due to a weakened immune system as a result of the virus. Oral thrush, dry mouth, tooth decay, canker sores, cold sores, and gum disease are all signs of HIV of the mouth. Cancer: Some people may fear oral cancer when there is a yellow coating on the tongue. However, yellow tongue is probably due to another problem unless you show other signs of oral cancer like unexplained bleeding in the mouth, numbness or a loss of feeling in the mouth, difficulty chewing, speaking, swallowing, or moving the tongue or jaw, and sudden weight loss. Strep throat and sore throat: Sometimes yellow tongue is due to a sore throat or strep throat. As a result, there may also be other symptoms like coughing, earaches, fatigue, swollen glands or lymph nodes, a stuffy nose, cold sores, bad breath, and yellow mucus on the tongue. In strep throat, there may be tiny white and yellow spots at the back of your tongue and tonsils. Mononucleosis (mono): Mononucleosis is commonly called mono. It is often caused by Epstein-Barr virus (EPV) and is transmitted by saliva. In the condition, the tongue and tonsils may develop a white and yellow coating. Other symptoms of mono include fatigue, swollen lymph glands in the armpits and neck, a sore throat, fever, night sweats, and muscle weakness. Yellow under the tongue: If you have a yellow coating on the tongue, you may also have a yellow coating under the tongue as well. Common causes of a yellow coating under the tongue include gallbladder disease, mononucleosis, alcoholic hepatitis, viral hepatitis, hepatitis A and B, EPV, cirrhosis, sickle cell anemia, and gallstones. A white and yellow coating on the tongue often indicates either wind-cold transforming into wind-heat, or just wind-heat. A yellow coating on the tongue will also indicate a yang deficiency. Thankfully, there are various Chinese remedies for yellow tongue. Chinese herbal remedies can help treat the root cause of your yellow tongue. It is a good idea to consult a traditional Chinese medicine doctor or herbalist to help select the appropriate remedy for your yellow tongue cause. Want to know how to reduce a yellow tongue coating naturally?Besides Chinese herbs, there are also other natural ways to reduce yellow tongue thrush due to candida or bacterial overgrowth. Tongue scraper and dental hygiene: It is important to brush your teeth and gums at least twice a day, and always after meals. After brushing, use a tongue scraper, preferably copper or metal. This will help remove the bacteria and yellow film from the tongue. It is also a good idea to use an alcohol-free mouthwash with antibacterial essential oils like thyme oil, peppermint oil, cinnamon oil, eucalyptus oil, Echinacea extract, lavender oil, and Centella asiatica extract (gotu kola). Since the mouthwash would be alcohol-free, it is the least likely to cause excessive mouth dryness that leads increased bacterial growth and yellow tongue. Dietary changes: The wrong diet can also feed the bacteria and yeast on your yellow tongue. It is a good idea to avoid foods like alcohol, processed food, dairy products, wheat and gluten, and products with sugar. Instead, your diet should contain plenty of raw and steamed vegetables; fermented vegetables like miso or sauerkraut; and sea vegetables like noi, wakame, and kombu. Basically, eat a lot of vegetables and some organic meat to treat yellow tongue due to oral thrush or candida. Other natural remedies for yellow tongue: Other natural yellow tongue thrush treatments include digestive enzymes, vitamin C, milk thistle, betaine HCL, ginger, gentian root, oil of oregano, garlic, goldenseal, caprylic acid, grapefruit seed extract, pau d’arco, wormwood, tea tree oil, and homeopathic candida albicans. Quit smoking: It is a good idea to have a solid plan for quitting smoking. Going cold turkey is quite difficult, even for the quitter with the best intentions. A good plan should help you prevent a relapse and other short-term and long-term problems with quitting the habit. Mind-body practices often used to help people quit smoking include aerobic exercise, yoga, acupuncture, meditation, guided imagery, aromatherapy, hypnosis, tai chi, and qigong. Also keep in mind that drinking coffee or alcohol are other habits that can prevent you from quitting your smoking habit. Drink plenty of fluids: Drinking plenty of fluids is another sure-fire way to prevent dehydration, and therefore help you get rid of a tongue discoloration like a yellow tongue. For those with an inactive lifestyle, aim to drink a minimum of eight 8-oz. glasses of filtered water daily. For people with a more active lifestyle, it is better to drink 16 oz. of water for each pound you lose. It is also best to avoid dehydrating liquids like caffeinated teas and coffee. You’ve had a yellow tongue for a number of days now, and the various treatments and natural remedies are not helping. What should you do? It may be a sign that something serious is going on that should be treated with the guidance of a medical or naturopathic doctor. It is a good idea to consult your doctor for further advice, and to help uncover the cause of your yellow tongue. It is also a good idea to make an appointment with your physician when you show signs of jaundice—the whites of your eyes or skin is yellow. It is important to get checked out since jaundice can indicate liver problems, Gilbert’s syndrome, cholestasis, and hemolytic anemia. “Traditional Chinese Medicine for Candidiasis,” Traditional Chinese Medicine Information Page web site; http://www.tcmpage.com/hpcandidiasis.html, last accessed March 7, 2016. “Tongue Diagnosis in Chinese Medicine,” Sacred Lotus web site; https://www.sacredlotus.com//go/diagnosis-chinese-medicine/get/tongue-diagnosis-chinese-medicine, last accessed March 7, 2016. “Black Hairy Tongue,” WebMD web site; http://www.webmd.com/oral-health/guide/black-hairy-tongue, last accessed March 7, 2016. Johnson, S., “Scarlet Fever,” Healthline, May 17, 2017; https://www.healthline.com/health/scarlet-fever. “Yellow tongue: Causes and treatment,” Dental Science, July 16, 2017; http://www.dental-science.com/yellow-tongue/. “Yellow Tongue Meaning, Causes, Cancer, Furry Tongue and Treatments,” Helpful Guides; https://www.helpfulguides.com/diseases-conditions/yellow/yellow-tongue-meaning-causes-cancer-furry-tongue-treatments, last accessed Feb. 8, 2018. “What Causes Dry Mouth?” Healthline; https://www.healthline.com/symptom/dry-mouth, last accessed Feb. 8, 2018.